Printing Method: Direct thermal, up to 3.3 ips. Resolution: 203 dpi (8 dots per mm). Communications: RS232 (RJ11 Type), IrDA, Bluetooth, Wi-Fi (802.11b), Custom RF. Paper Width: Up to 3.125" (7.9 cm). Graphic rich labels, wireless communication, quick production of receipts, resistance to accidental damage, or just a reliable workhorse printer - whatever you need, the Printek MtP300 Mobile Thermal Printer can provide. All popular wireless options, including IrDA, Bluetooth, and Wi-Fi, are available. Truly mobile, this lightweight printer can be used in any orientation and can be mounted or carried. Couple that with the printer's wide range of media options, and you'll find the MtP300 the perfect mobile printing partner for your needs. The standard MtP300 model accepts a large continuous roll for a maximum number of print jobs between reloads. The MtP300LP (label printer) includes enhancements such as positioning sensors to optimize printing of labels. The printer is overmolded with shock absorbing elastomer, capable of withstanding repeated 4' drops to concrete. A Li-ION battery pack provides enough power to print over 500 times on one charge. The battery can be recharged in about 2 hours, using the built-in charger or the easy to use external battery charger (option). MtP series printers feature best-in-breed power management, full on board menu selections, a useful suite of integration and configuration utilities and tools, advanced security features on bluetooth models, and emulations of popular printer brands. MtP printers are a virtual drop-in solution for many existing mobile printing applications. Flexible Wireless Options: IrDA, Bluetooth, Wi-Fi (802.11b), Custom RF. All wireless printers also include serial port. Software Available: Drivers for WIN 98, 2000, XP; Windows CE/Pocket PC and Palm OS print utilities and SDK's. Remote Printer Setup Program provides convenient configuration via a Windows interface from any computer with a serial port. Emulations: Emulates many popular printer brands (O-Neil, Zebra CPCL and ZPL, and Printek Mt3). Can be upgraded as new emulations become available. Paper Type: Direct Thermal Roll, use Printek high quality 25 year archival rated paper for best results. Roll Size: Maximum roll diameter 2.625? (6.7 cm), allows roll widths from 2 to 3.125 (5.1 to 7.9 cm). Roll Capacity: Approx. 171' (52.1 m), Approx. 340 6? long receipts. Core Size: 0.75? (1.9 cm). Endurance: 500 pages or more than 2000 printed inches per charge. Recharging: 2 hours, via on-board charger or optional external charger. Optional: 100 to 240 VAC wall adapter, 12 to 24 VDC in-vehicle adapter. When plugged in, the printer can be used while recharging the battery or can be run without the battery. L x W x H: 7.0? x 5.8? x 3.3? (17.8 x 14.8 x 8.4 cm). Weight: 1.96 lbs. (.89 kg) including battery. Operating Temp: 10 to 122F (-12 to 50C). Storage Temp: -4 to 140F (-20 to 60C). Humidity: 10% to 90% RH (non-condensing). Rated IP54: per IEC 529, without optional environmental case. Buttons for Power, Paper Feed and Setup Menu Navigation. 4 illuminated icons for general fault, wireless connection, MCR ready and battery status. 2 line LCD for system alerts and messages, configuration setup and battery charge indicator. Sensors for paper out, door open and black mark detection. LP models add rear black mark and label gap detection. Survives multiple 4 foot drops to concrete (each face) and conforms to IEC 68-2. MTBF: 10,000 hours @100% duty cycle in normal use. FCC Class B, CE mark, UL listed AC adapters, E-mark on In-Vehicle adapters. All MtP printer models can withstand repeated 4-foot drops to concrete and are backed by a comprehensive standard warranty that covers the entire printer case, battery and print head for one full year. 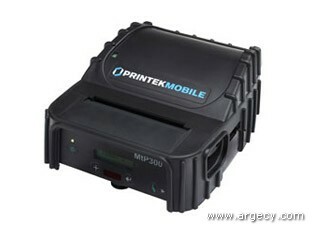 Many mobile printer vendors offer warranties limited to 90 days on the battery and six months on the print head. Extended warranties are available.